The subscription box phenomenon kicked off a few years ago (Birchbox launched in the United States in 2010) and has come a long way since. In April 2017, Birchbox will open its second brick and mortar store in Paris. I personally subscribed to MyLittleBox (launched by MyLittleParis) when I lived in France. I liked it for the variety of products I got: tea, sunglasses, nail polish, cream… It was my monthly surprise. The experience made me want to write about the concept of these subscription boxes. Today they exist for a multitude of products, from the beauty products that started the movement, to wine, cheese, outdoor gear and even artisanal products from around the world. There are even listing sites like canadian subscription box addict that blog about them, and others like la box du mois and subscription boxes that list and compare the boxes available in certain regions. Using questions asked at the time of subscription to tailor the boxes’ contents. For example, Birchbox creates user profiles based on physical characteristics, personal style and preferences. 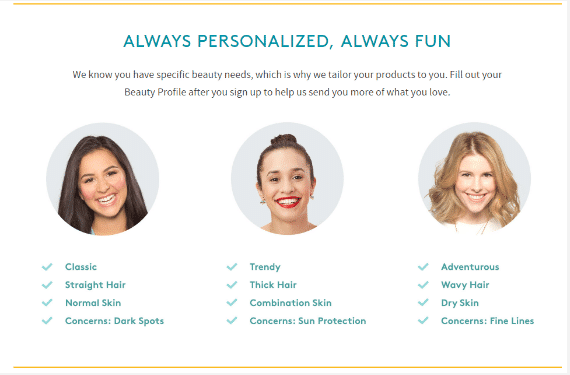 Birchbox also lets customers choose whether they want to receive lifestyle products, or simply beauty products. Operating like Lufa Farms-style vegetable baskets. A basic selection is made by default, but users have the option of modifying what comes with each delivery. This involves adjustments to inventory and the cost of the box, which brings this closer to a re-supply service since the products are actually chosen by the user. Another formula was tested by Luxe Pineapple, which tried allowing users to choose from among four different boxes every month, but the test seems to have been a failure, since today the site makes no mention of this option. And finally, by asking users to choose their own package. Cook It, for example, offers boxes with the specific food items you need to cook a particular recipe yourself. Subscribers have three options to choose from. Here, the goal isn’t to generate sales through product trials, but rather to simplify the subscriber’s life by solving the everyday problem of shopping for groceries, deciding what’s for dinner and measuring out ingredients. First off, let’s talk about how we can determine the profitability of a project like this. Profitability can be broken down into two elements: customer lifetime value (CLV) and cost of customer acquisition (CAC). So, P=CLV-CAC. The goal here is to make sure that the customer lifetime value is significantly higher than the cost to acquire that customer. A) Customer lifetime value: How do you figure out what that is? By looking at your average revenue per customer, and the average length of a customer relationship. The advantage of the subscription model is that, as opposed to the single purchase model, both of these elements tend to grow; recurring revenue is guaranteed until the end of the membership. Cook It, for example, saw a major increase in the lifetime value of its customers when it became subscription-based, due to an increase in the average order per customer, as explained at the beginning of this article. B) Cost of customer acquisition: What is this? It can be calculated based on your total sales and marketing costs, and the total number of sales made. It’s possible that this cost will be higher in a subscription model than for one-time sales; a subscription is a bigger commitment on the part of the user than a single purchase, so you need to win their trust before they’ll buy. However, since the subscription allows you to bring in recurring revenue, the longer the subscription lasts, the more profitability will go up. And the cost of acquisition will be spread over months, even years. That’s where another concept comes into play: how many months does a membership need to last to amortize the cost of customer acquisition? This depends on the monthly cost of the membership, on the cost of customer acquisition (of course), and we can’t forget about attrition (unsubscribe rate). Essentially, if you need subscribers to stick around for a year before they become profitable, you’d have a major problem if most of your customers unsubscribed after less than a year. MyLittleBox is a great example of this. MylittleParis – a popular newsletter of Parisian secrets – already had a built-in critical mass of potential customers for its subscription box thanks to its newsletter database; a ready-made community of devotees. When the box launched, the first month’s supply quickly sold out. Throw in a good marketing plan, and the launch couldn’t lose. Then there’s the quality of the box, the products it contains, and the customer service they provide, and you have a recipe for long-lasting success. Any company that already has a base of recurring customers can use the same strategy. MyLittleBox had an unusually strong launch, but that doesn’t mean a well-thought out communications plan can’t be another effective way to get the word out. Watch out though, this phenomenon isn’t new anymore, so finding subscribers for an already saturated niche like beauty products won’t be as easy as it was in 2010 when the concept was new. In addition you can’t forget to factor in your burn rate. Acquiring new users can be costly, so how far can you afford to go before you burn up all the funding available to you – knowing that subscribers take a while to become profitable? You would need to calculate how many people you can acquire with the liquidity you have available. A great article about this was published by the Harvard Business Review for anyone who wants to read more. Ok, but how? Through the products you offer, the frequency of your deliveries, through your customer service, your communications… Flowers, for example, are an excellent product for a monthly surprise box (and one that’s barely been exploited). Bloom & Wild offers packaging that fits into standard mailboxes in the UK, which saves users a trip to the post office; especially nice with perishable items like flowers. Find a niche. Fishing fanatics, scrapbookers, design-lovers… A good entrepreneur needs to know their market, and be passionate about the theme they’ve chosen in order to bring the right expertise to selecting products and keeping members happy in the long run by keeping things new and fresh. In this example, a membership works to supply a collection. Simplify people’s lives. Allow people to stock up on items they use every day, like razors, toothbrushes, food (in the UK you can have bacon delivered weekly!). Here a membership works more as a re-supply of consumer goods. The ideal would be a mix of the two! Online shoppers are cost-aware and highly solicited by brands. As a result, they expect value in exchange for a subscription. The price of a subscription box varies, but most fall into the range of $15 to $45 US. Subscribers expect to get products with a higher value than the cost of the subscription. They know that brands are giving some of the products away, and that the volume of subscribers brings costs down. And beware of samples: brands may offer them for free, but there will be more variation as the number of subscribers grows. In addition, including samples can alter the perceived quality of the box. Since brands have an interest in providing products for a ready-made test market, you have the advantage. Negotiate with them to get full-size products and have them cover part of the cost. In exchange, brands get potential new customers for their products. I really liked the angle MyLittleBox took: they created their own products branded My Little Beauty, My Little Box in addition to sending products from recognized brands. These branded products reflect the image of the box: stylish and connected. You can buy them online, and the list price is often equivalent to the cost of an entire box. The quality and design of the container. The quality of the products and the brands in the box. Long-term consistency: do the surprises stay interesting month after month? Is there enough variety? The goal is to not be boring, and to avoid becoming part of the cycle of waste by adding to the pile of products subscribers will never use. Customer service: see my next point. One of the greatest challenges with home delivery is in the last mile. The logistics involved in delivery can generate significant costs for the merchant, and there’s a high risk of customer dissatisfaction if things go badly. The more the merchant works to reduce irritants related to delivery, the more satisfied the customer will be. What happens if no one is home to accept the package? This could be problematic for a merchant without a retail store, or if the box is difficult to transport or contains fresh items. To avoid unsubscribes, good customer service is essential; what happens if a customer has a negative experience? How will the company react if a subscriber is dissatisfied with the month’s contents? Compensation in case of late or missing delivery. Inventory management is made easier by the subscription model: there are fixed deadlines to receive stock for each box. However, there is still a certain amount of buffer that needs to be built in, specifically to compensate for broken products, undelivered boxes, etc. This is even more significant for perishable goods. For the example of the customizable Lufa Farms baskets, the same inventory management principles apply as for a physical store. A few veteran merchants have worked out strategies to get rid of stock from old or current boxes. For example, for a while MyLittleBox was promoting the idea of buying or gifting a “collector’s box.” These boxes were curated by the team at MyLittleBox to ensure that leftover stock was used in a way that wasn’t frustrating for customers. The cost was lower than that of a regular box (10 euro rather than 16.90 euro). This service is now no longer available. The next step for this business model is to sell products from the box online individually, as we saw MyLittleBox do with MyLittleCorner, which sells mainly products developed under the MyLittleBeauty and MyLittleBox brands. According to Birchbox, the fact that these online shoppers don’t have to be subscribers plays an important role. It allows the company to continue its relationship with former subscribers who want to continue to buy products on an ad hoc basis. How can I adapt this to my business? So, you want to jump on the trend of subscription-based business, and generate recurring revenue for your own company? There are two types of subscriptions: surprise boxes and supply boxes. Merchants who produce local products might choose to partner with subscription services like Lufa Farms. Their products would be listed on that platform, opening up another sales channel. What about you? Have you ever signed up for a subscription box? Did you like it?